On 5 January 2014, 39 pilot whales stranded at Golden Bay. 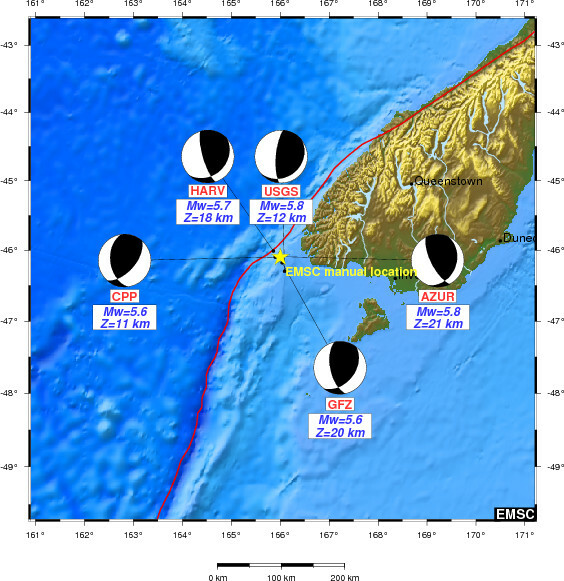 On 16 December 2013, at 01:07 AM when the pod was likely on a feeding dive, a shallow magnitude 5.7 earthquake suddenly erupted in the seafloor off the West Coast of S. Island, N.Z. The focal point of the seismic shaking--defaulted to 10 km below the ocean's surface--might have actually been no more than 4-6 kilometers deep in the seabed. As shown by the beach ball outlines below, the direction of the first motion in this event was vertical. The P and S waves punched the rock/water interface with up and down motion similar to a gigantic piston, pushing and pulling at the bottom of the water column, generating potent changes in water pressure directly above the epicenter. Seismic over and under pressure disturbances cause barotrauma in the cranial sinuses and air sacs. 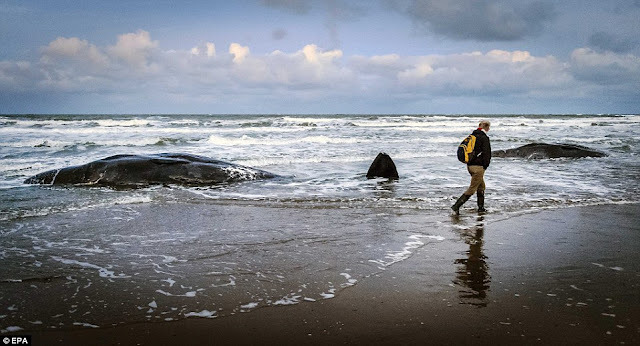 Since this enclosed air is used as acoustic mirrors to funnel and channel sound waves, the injury immediately disables the biosonar system of all the exposed whales. The injury knocks out their sense of direction. Their swim path away from the epicenter is always downstream in the path of least drag. The flow of the surface current from the epicenter was northeast along the Western Coastline of South Island. Nineteen days later, unable to echonavigate due to barosinusitis caused by the seaquake, 39 injured pilot whales swam with the downstream current into Golden Bay. They had no idea where they were. Wind, the primary force responsible for surface currents, was blowing ~20 miles per hour out of the west. Waves on the surface transfer some of the energy from the moving air to the water by friction. This tug of wind on the ocean surface begins a mass flow of surface current. The moving water "piles up" in the direction the wind is blowing. Water pressure is higher on the "piled up" side, and the force of gravity pulls the water down the slope-against the pressure gradient- in the direction from which it came. However, the Coriolis effect intervenes. Because of the Coriolis effect, surface currents flow to the right of the wind direction Northern Hemisphere. In the Southern Hemisphere currents flow to the left. This would have set the surface flow of the current in a northwest direction toward the sandy beach. This would also have created a circular flow of water inside Golden Bay. The non-navigating whales simply swam along downstream with the flow of the surface current and were washed into the sand. As you can clearly see in this video, the flow of the current was washing the whales into the sand. As the tide increased and the water got deeper around them, that flapped their tails in an effort to swim free of the sand. The net result of this effort was to be carried further up the beach to the high water mark. Because they were washed so high up the beach, it was impossible to get the large animals into deep enough water to refloat them. Besides, strong shoreward winds would have prevented any refloat attempt. Twelve of the whales died. Rather than prolong the suffering of the remaining 27 whales, the rescuers decided to humanely euthanize them. This scene has been repeating itself for millions of years.